: a resilient device, typically a helical metal coil spring, that can be pressed or pulled but returns to its former shape when released, used chiefly to exert constant tension or absorb movement. T here are many different types of springs and they come in all shapes and sizes. As stated in the first definition above they are typically a helical spring metal coil. 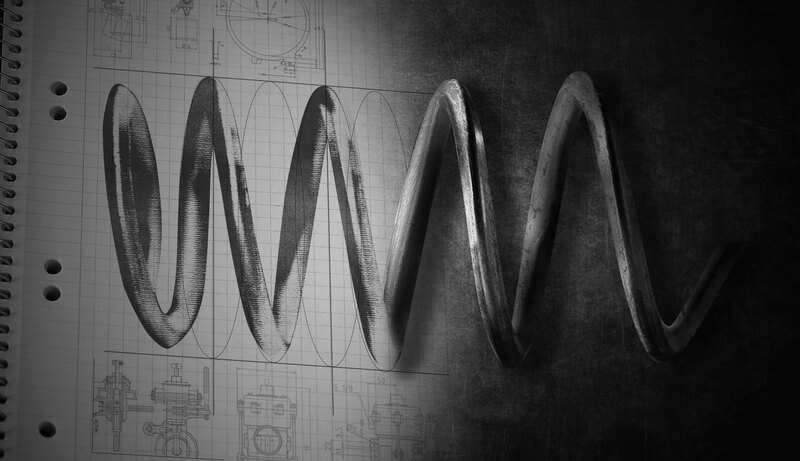 While springs can be formed from flat sheet metal, stainless steel or shaped wire, at Cook Spring, our spring manufacturing expertise lies solely in the design and manufacturing of medical springs and wire forms using round wire. We have developed proprietary equipment for manufacturing long, continuous spring coils that can accommodate flat wire but every other type of spring made at Cook is formed using round wire only. Helical springs are generally classified or defined by the way they exert or absorb force which results in three basic categories: Compression Springs, Extension Springs and Torsion Springs. There are also certain wire forms that could technically be classified as a spring, given they return back to their original shape after being distorted, but aren’t necessarily a helical spring. A helical compression spring is used to resist applied compression force or store energy in the push mode and is widely accepted as the most common type of spring. In the compression spring world, the most prevalent configuration is the straight cylindrical spring. However, they can also be coiled in the shape of a cone, barrel or hourglass with variable or constant spacing between the coils. Designing a custom spring shaped liked this can help reduce solid height, buckling or produce non-linear load characteristics. Naturally, the amount of deflection or distance it is compressed is directly related to the amount of force applied. The energy expended in pushing the spring is stored in it and is recovered when it returns to its free state. If the force is too large, the spring will be permanently deformed (also known as taking a set) and will not return to its original length.